Hi! I’m Nadia. Welcome! I’m here to help you unearth your full stories and unlock your deep creativity so you can write your best work, live your best life, and be an agent of change for a more just, healthy, sustainable world. Your story matters. I’m so glad you’re here! 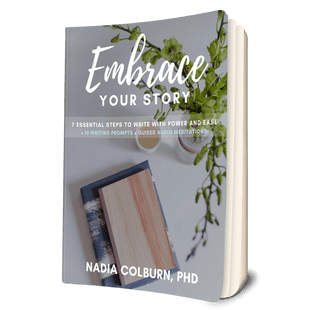 I’m Nadia Colburn, PhD. I’m passionate about giving you the tools and support you need to write your best, most aligned and powerful work and to live your best, most aligned and powerful life. I’ve seen that we can come into our true authentic power when we come back to our centers and understand our full stories, with all their complexity and multidimensionality. I have a BA from Harvard and a PhD in English from Columbia University; my poetry and creative nonfiction have been published more than 80 national publications, including The New Yorker, Spirituality & Health, American Poetry Review, Boston Globe Magazine, slate, Lion’s Roar, Harvard Review, Kenyon Review and many other places, and my debut poetry collection, The High Shelf, is forthcoming in 2019. I’m also a serious student of Thich Nhat Hanh, a Kundalini yoga teacher, an activist for peace, equity and the environment, a mother and wife, daughter and friend, a life coach and a writing teacher and coach. And I’ve done my own fair share of personal healing and growth. I have seen that our inner work and our outer work must go hand in hand to get optimal results. Whether you are already a published author, a poet, memoir writer, business person, social justice worker, stay at home mom, retiree, or any combination of the above, I can work with you to help you claim your authentic voice—and vision—and write the book or work you have always wanted to write and/or find alignment in your life. I have a wide variety of programs and can develop programs suited to your individual needs. I hope you’ll explore them. Please reach out to me with any questions! ALIGN YOUR STORY is an online course/writing retreat to help you break through blocks, connect with your authentic voice and story and write—with more ease and power-—the work you are meant to write. The course brings together reading and writing with mindfulness, meditation and yoga and integrates the best of the mind, body and spirit. Study authors such as Rumi, Tolstoy, Mary Oliver; write your most skillful, authentic and powerful work; and bring your writing—and your life—into alignment. Once you enroll, you have access for life. Use the structure provided or go at your own pace. Go deep inside, connect with community, cultivate your craft. The class is designed for writers of all genres and all levels and for people with all levels of meditation and/or yoga experience. Come with an open mind ready to dive a little deeper, play a little harder, relax with a little more freedom, and take your work to the next level. SIGN UP FOR LIFETIME ENROLLMENT.